C-Project Premiere – Come and Join Us! 2011 was a busy year. 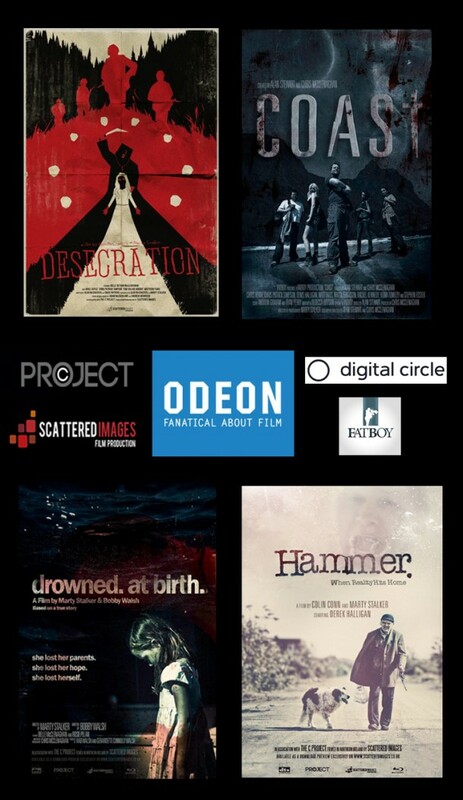 I feel very privileged to have gotten the chance to work on a variety of film projects and at the Odeon cinema on the 31st of March I will get the chance to see some of my exploits in Coast and Desecration. After spending the day at a deserted beach on the north coast of Ireland, a group of office workers return to find their car stolen. Alone and without communication, they are faced with a long walk back across the coast or a longer walk back through the deserted country roads to the nearest town. Things only get worse for the group when they discover they are being stalked. On a dark remote road a car is stopped by at a military check point. Something isn’t right and the soldiers find themselves in an unexpected situation… with deadly consequences. The other films to be premiered that day will be Drowned at Birth and Hammer (for which my beautiful wife composed the music). The trailers are below. Everyone’s welcome to attend – the event is free of charge and you’ll get the opportunity to see the work of some of Northern Ireland’s most exciting indie film makers. See you there! Chris is an Irish actor who is based in Belfast, Northern Ireland. http://www.imdb.com/name/nm1247379/?mode=desktop&ref_=m_ft_dskr He has collaborated with the best directors in film, television and theatre in projects such as the award-winning The Magdalene Sisters (Momentum), The Boxer (Universal), Fifty Dead Men Walking (Brightlight Pictures), Good Vibrations (Revolver Films), Mrs Brown's Boys D'Movie (BBC Films), 71 (Warp Films), Shooting For Socrates (New Black Films), and High-Rise (Recorded Picture Company). On TV, Chris has played leads in The Guards (TV3) The Man Who Crossed Hitler (Hardy Pictures for BBC) The Clinic (RTE) The Family (BBC) Missing (BBC), The Titanic Enquiry (BBC), Ripper Street (BBC), Galavant (ABC) and The Fall (BBC). Chris has worked with some of the top theatre companies in the UK and Ireland. Additionally he is proud to have both starred in and co-produced a successful UK/Irish tour of The Wrong Man, which received critical acclaim throughout its run. Posted on March 18, 2012, in Uncategorized. Bookmark the permalink. 1 Comment.